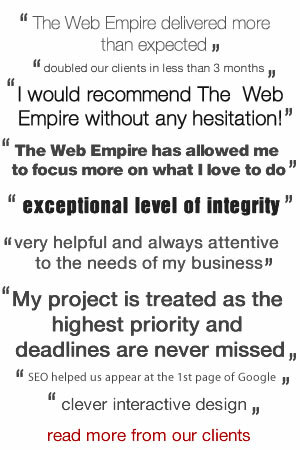 The Web Empire has multiple years of experience in Search Engine Marketing and Search Engine Optimization. PPC Management (Pay Per Click) will benefit your business from our experienced AdWords Certified Professionals and Semrush Certified Professional, providing better results on your paid campaigns. We provide all our clients the best solutions possible and the best and honest estimates, without grey areas and hidden costs. All our plans are straight forward, knowing from the beggining what you'll face cost wise. Google AdWords is the #1 PPC tool on the web. Our team knows how to run a PPC campaign, how to analyze the industry and the keywords, how to read the reports and how - at the end of the day - to optimize your AdWords and adCenter campaigns in order to receive the most revelant and quality clicks possible. Which Service is the best for my business? Your marketing budget, your goals and your industry is what determines your PPC management pricing level. When you choose a package you know that there is no hidden fees behind it. Keep always in your mind that the cost for PPC management varies based on the size of your business and each individual pay-per-click campaign. Prices also depends on the keywords, the targeting, the Geocraphic area and few other factors. Except the above standard PPC management fees our company offers tailor made pricing plans for your business.